I wish I could BLOG a smell. As we were driving through the Texas desert I had to stop the car because the smell of chaparral was so strong I thought I must be imagining things. Once you smell chaparral you never forget how it smells. Although I have never lived in a region where it grows, I had used it in herbal mixtures before so I recalled its pungent scent – a scent that for me is associated with healing, with good energy and with the scent of opened herb jars on the mixing table. However, smelling it in the desert is apparently only a rare treat that happens after it rains. When I pulled over the car to see where the smell was coming from I was shocked to see miles and miles of chaparral (creosote or tarbush are two other names for it) sprawled across the desert on either side of the high-way. It is such a fascinating plant. Some say it is the longest living plant on earth, dating back more than 13,000 years. It is poisonous to all mammals (although it can be used topically on humans and as a tea) as a food but it supports over 22 kinds of bees and many more insects that survive solely on its being. Without this bush over 65 kinds of insects would die out. Native Americans used the leaves to create a natural sun-tan lotion. However, modern Americans use the oil from the leaves to protect wood (that sticky stuff on railroad ties) from insects. Applied to the skin, chaparral can have a remarkable healing effect on eczema, herpes, cold sores, psoriasis, and contact dermatitis. Place a sprig of Creosote leaves and flowers in a cup. Add boiling water, cover and steep 5 to 10 minutes (depending on strength desired), then strain. You may want to sweeten this strong, aromatic tea with honey. 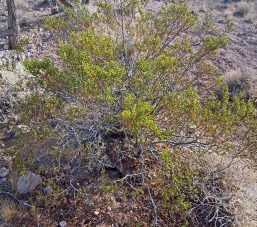 California’s Cahuilla Indians brewed Creosote tea to relieve coughs, colds, flu, infections and bowel complaints. They also covered their heads with a blanket and inhaled the steam of creosote leaves in a boiling pot of water to relieve congestion. Herbally it is being used in the treatment of cancer, although great care is taken with its use since it can cause liver-trouble when taken in excess. Disposable glass jar that holds 8 or more oz. Method: Put water and the Chaparral stems in the disposable glass jar. Put lid on and shake it, then let it sit overnight or up to 24 hours. Take stems out and pour the water into the spray bottle. Add drops of essential oil as desired. Label. Shake before using.